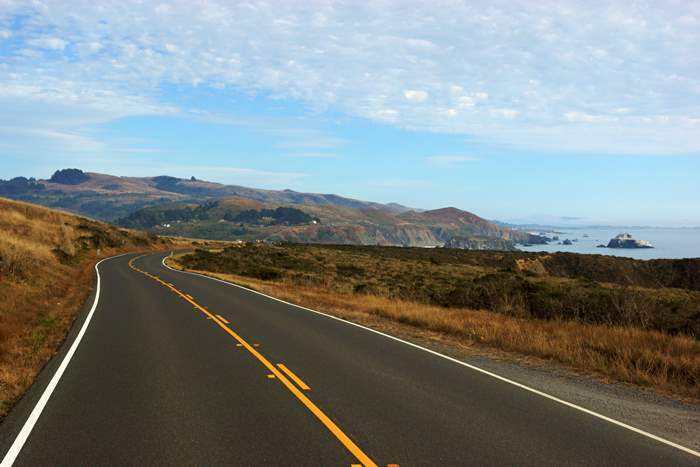 A drive up California Highway 1 is not the easiest way to see northern California, but it sure is an adventure. 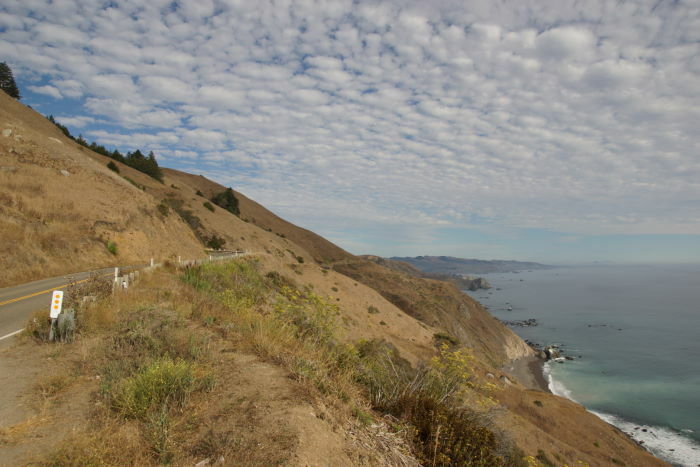 Up here, the Pacific Coast Highway gets a new name — the Shoreline Highway — but the idea is the same. It’s miles and miles of sometimes curvy, sometimes narrow pavement, that hugs a rocky coastline and connects idyllic small towns. Committing to a drive up this portion of Highway 1 requires a lot of time. It also demands some tough choices: do I stop at this beach or the next one? And if I stop at all of them, will I ever get there? California 1 crosses the Golden Gate Bridge as it leaves San Francisco, then splits from the 101 and stays closer to the coast. 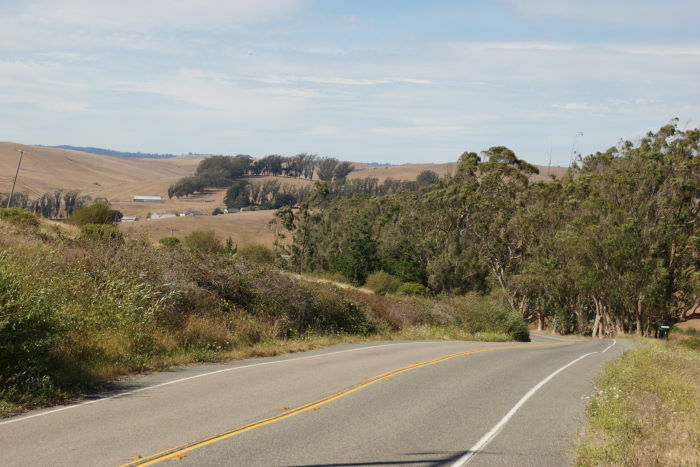 On this page, I’ll show you just a little bit of what you’ll see between San Francisco and Fort Bragg — the best place to find a motel room after a full day of driving and sightseeing. I mentioned the tough choices you’ll have to make, when driving the Shoreline Highway. It’s no joke. I wanted to stop in a million places, and take countless photos. But, the demands of time required me to stay on at least some sort of schedule. So, I’ll hit a few of the highlights here — and you should also check out my 2007 drive on the same road, in the opposite direction. Just a few miles after splitting from US 101, north of the Golden Gate Bridge, Highway 1 rejoins the coast for a look at the Marin Headlands, and one last glance at San Francisco. 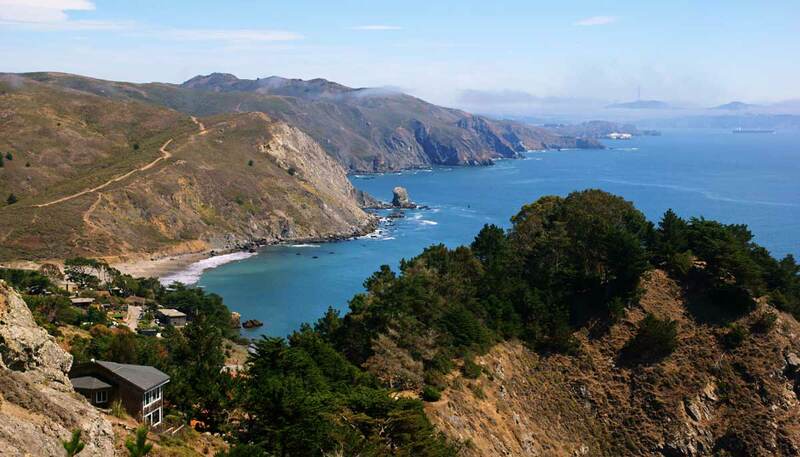 Choose a visit to Muir Beach (visible in the photo above, over on the left) or take a short hike at the Muir Beach Overlook. The viewpoint allows you to see San Francisco’s iconic and ugly/beautiful Sutro Tower — although the Golden Gate Bridge itself is slightly out of view. 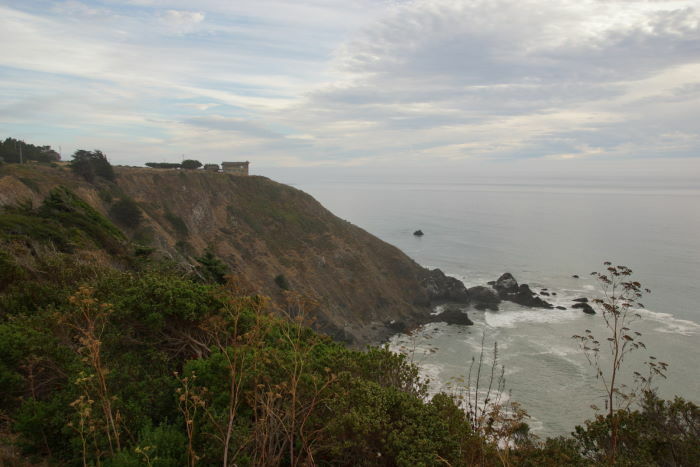 I’ll share more pictures of Muir Beach Overlook on a separate page. 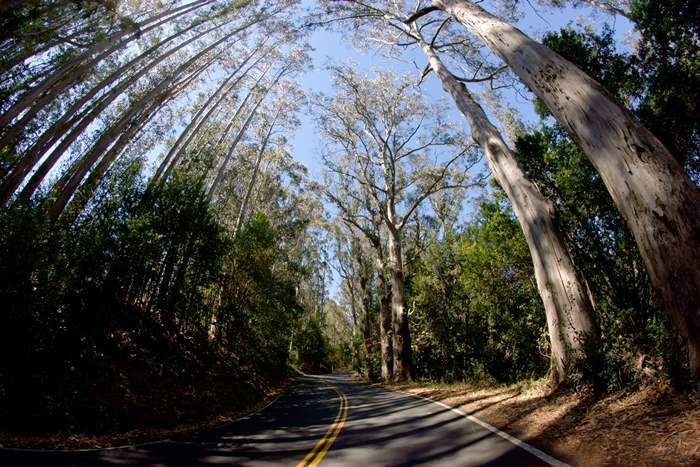 North of Muir Beach, I felt compelled to stop a few times and take pictures of the trees that smothered the highway. You don’t always have a coastal view on the Shoreline Highway, but even when you’re slightly inland, it remains interesting. In this area, Point Reyes juts out into the Pacific. 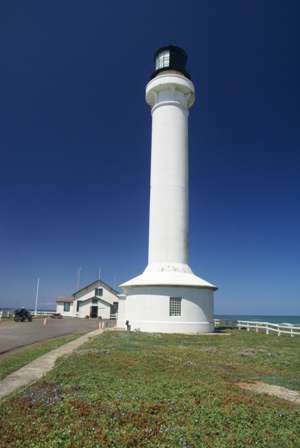 You can drive out to a lighthouse along the waterfront. I checked it out in 2007, but skipped it this time. 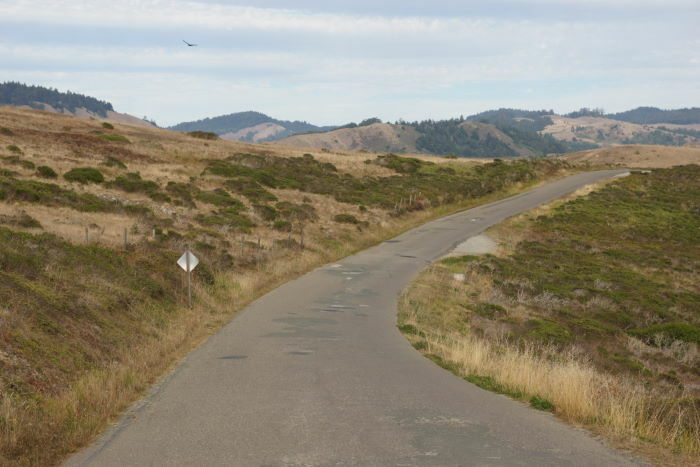 Somewhere around Tomales, California, I snapped this photo of the undulating highway, then resumed driving. My next stop was just after the town and the creek called Salmon Creek. 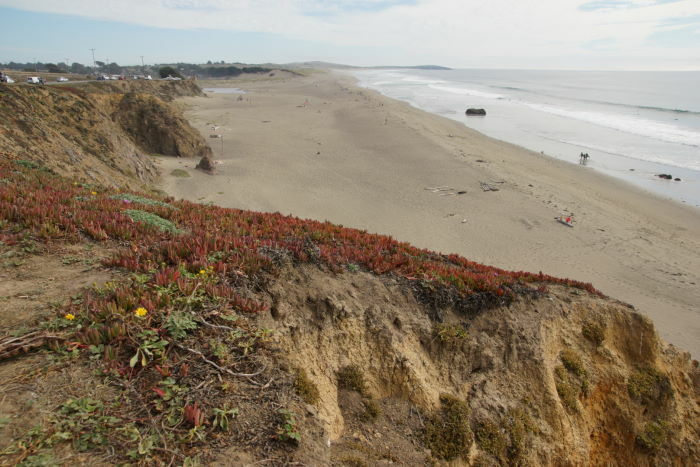 These cliffs are right at the edge of the highway, and Bodega Beach is below. Plenty of people had stopped here, and most made their way down to the water. I enjoyed the view, and got back on the road again. 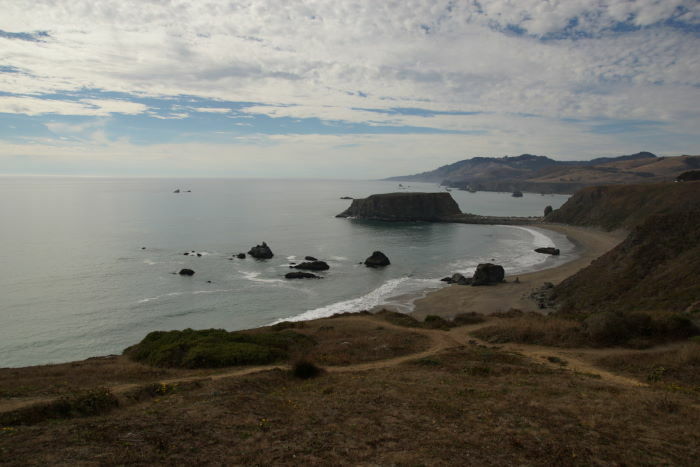 Before you cross the Russian River and arrive in Jenner, California, consider a detour off the main road out to Goat Rock. … of Goat Rock. If you drive all the way out to the end of the road, there’s a parking area in that gap between the rock and the mainland. Back on Highway 1, after crossing the river and passing through Jenner, I stopped along the road for a shot looking back to the south. That’s a fine looking road. 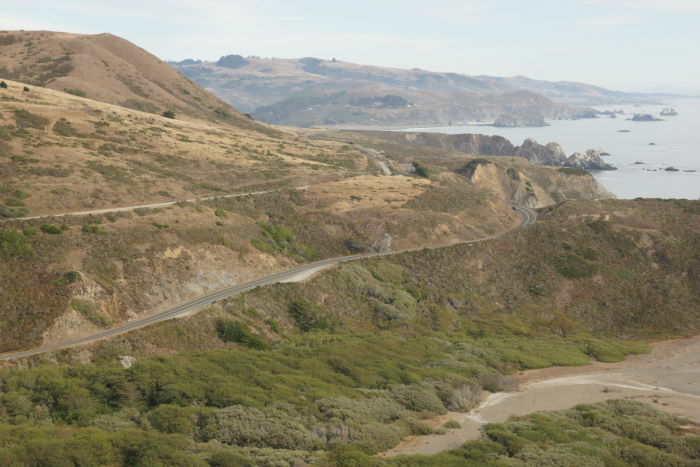 … the road crosses Russian Gulch Creek, then climbs through some tight curves to an even better viewpoint. Clearly, at this point, I’m being tempted by far too many photo stops. I made it about 7 minutes further, before stopping again. Here, the road is perched high above the coast. 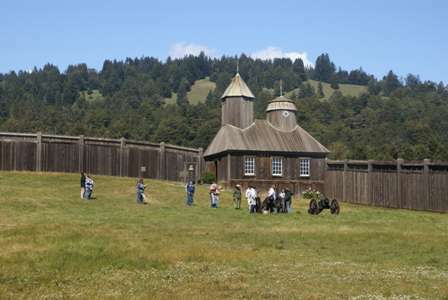 Shortly after this spot, you’ll find Fort Ross State Historic Park. 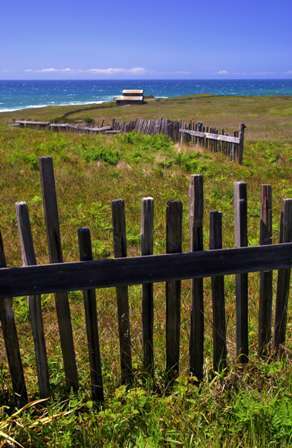 It’s an especially scenic spot on the coast, where a Russian settlement from the early 1800’s is preserved. I checked it out in 2007, so I skipped it this time. Yes, by this point in the drive, I realized I had no choice but to cover some miles. Hey, no problem, the Drivelapse cameras on the roof of my car would cover the photography for a while (you can see those videos at the bottom of the page). Plus, the sky was starting to grow cloudy, and I knew that I wasn’t going to get the photos I wanted (and a nice sunset was growing less likely as well). … when I took a much better picture of it. 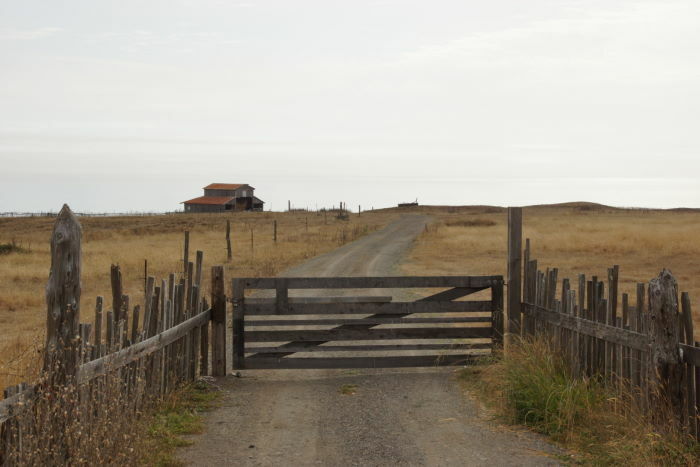 The barn is just south of Point Arena, which has a nice lighthouse and great views of the coast. This is another spot that I explored in 2007, but not this time. … near Mallo Pass Creek. Fort Bragg was still an hour away, and not long after this stop, fog rolled in, and I accepted that it was time to find my motel. 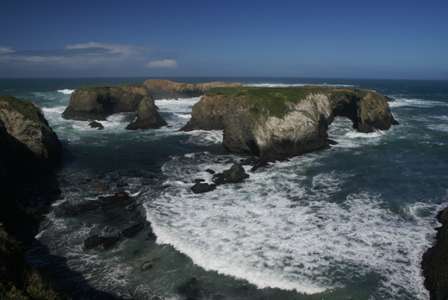 One more place worth mentioning: Mendocino. In fact, it’s worth much more than a mention. You could easily spend a day or a whole weekend in this quaint town. Romantic B&B’s are your best choice here. I explored the coastline (and took this picture) during the 2007 trip. When I checked into my motel in Fort Bragg for the night, I chatted with the clerk at the motel. She seemed surprised that I had driven Highway 1 all the way up from San Francisco. It was only then that I realized that this isn’t something most people do — because it is a long drive — almost too long to properly enjoy its beauty. So, keep that in mind as you plan your trip. Here’s a look at the drive from San Francisco to Fort Bragg. Yes, it’s a 59 minute video. I told you it was a long trip. You’ll find this long video broken down into shorter segments on my Youtube channel.